Nicholas Metivier Gallery is pleased to announce an exhibition of paintings by Ric Evans. The exhibition will open on September 8th and run until September 24th with an opening reception on Thursday, September 8th. This is Evans’ fourth exhibition at the gallery. Central to Ric Evans’ practice is colour and form. Evans’ work is informed by his surroundings, deriving shapes from various spaces that he finds between buildings, chairs, parked cars and other moments in everyday life. These shapes become what he describes as an armature to hold his idiosyncratic combinations of colour that create his distinct geometric compositions. In his latest works, Evans’ use of colour and form is more intuitive and arresting than ever before. For the canvases, Evans begins with a straight edge template, such as a trapezoid or triangle, in the center of each painting. Then, building outwards, he attaches boldly coloured rectangles that skim or leave narrow passages between the outer edges of the form and the parameters of the canvas. The freely floating placement of a recurring motif within its rectilinear confines is exemplary of the more minimal and confident direction of Evans’ work in recent years. Evans employs industrial copper or his signature black paint to add weight and dimension to his flat surfaces. 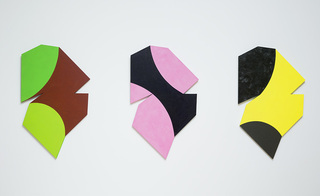 Alongside Evans’ canvases are a series of shaped panel paintings. Evans has been making these works since the early 1980s however his recent renditions are his most eccentric and playful to date. The works entitled, The Flow of Surprise, are anthropomorphic in shape and grouped into diptychs and triptychs to highlight optical illusions that play with our perception of space and scale. The Changing Nature of Location series are more simplified forms resembling shields or plaques. Evans often applies the paint on the panel works with a palette knife to enhance the materiality of the object as well as reveal the hand of the artist. Ric Evans is one of Canada’s preeminent abstract painters, having worked in the genre of geometric abstraction for the last forty years. His work is included in many corporate and museum collections in Canada including the Art Gallery of Ontario. In 2015, Evans completed a large-scale commission for a prominent lobby location in one of the Toronto Dominion Towers in downtown Toronto. Evans was included in the internationally renowned curator, Roald Nasgaard’s highly acclaimed anthology, Abstract Painting in Canada (Douglas & McEntyre, 2008).